This photograph captures the moment that marks the grand entrance at this Liberty Grand wedding reception. 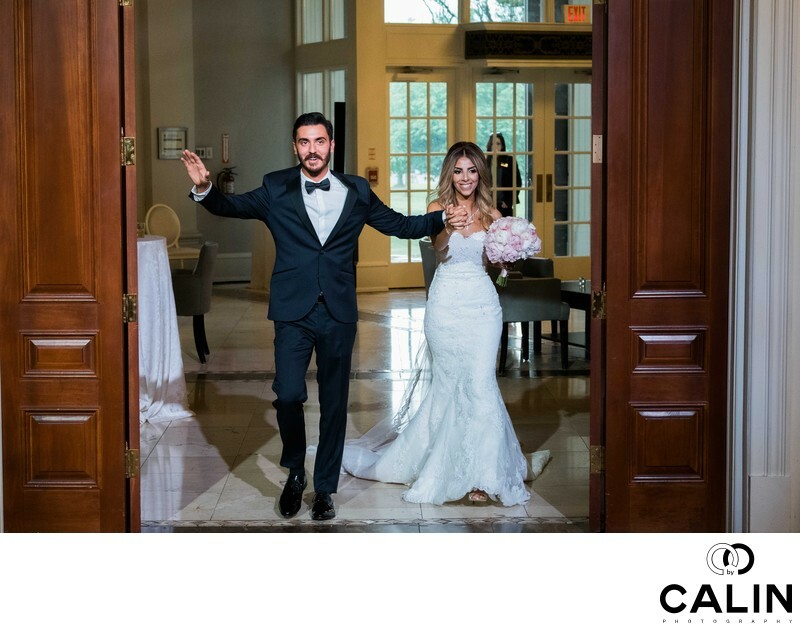 The Grand Entrance is that part of the wedding reception when the bridal party, followed by the bride and groom are announced end enter the banquet hall. The guests are usually standing, clapping, waving napkins, throwing confetti or petals and so on. The grand entrance is usually followed by the first dance and sometimes the cake cutting. However in some cultures (especially in the middle east), the guests joined the bride and groom on the dance floor and the party starts. In my long career as a Toronto wedding photographer I've seen a huge variety of entrances from the typical ones, where the bride and groom open the doors and come in dancing, to others where the bride and groom came through a hidden door in the just showed up on the dance floor and started having the first dance as husband and wife. Not all the couples decide to have a grand entrance and lately I have photographed quite a few special events where the bride and groom's did not want to be the centre of attention.